Full motorcycle licence time ! After 3 years on a scooter I decided it was time to upgrade and complete my full licence. Its a pretty full on procedure to be honest. After renewing my Compulsary Basic Training Certificate (CBT) it was on to the DSA to sit my Theory and Hazard Perception Test. These were the easiest parts of the equation to be honest! 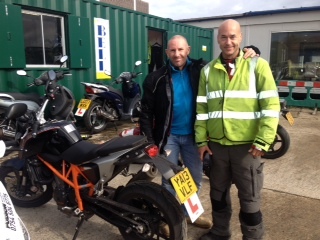 Next it was off to Fusion Motorcycling for 3 days of full on lessons with Andre the Direct Access instructor. Check out their site here. Its a very beneficial thing to have lessons with a good instructor and I really feel I learnt a lot from Andre. He is very focused and the way he teaches is very laid back but nonetheless informative. After two days on the big bike it was off to attempt Module 1. Module 1 is a specially constructed left or right hand course where your skills like manual handling, slalom, figure of eight, 19 mph circuit ride combined with a swerve and stop test. Sounds tough but if you relax and stay focussed its a breeze. I managed to pass with zero faults. Feeling pretty happy we left the test centre and completed day 2 of training. Then we booked Module 2 for a week after my final day training. The day arrived and I was very very nervous. After arriving at the test centre very early I met the examiner and he explained the test and got me to sign my life away before putting on a radio/mic and heading to the bike. First was a couple pre-test questions like: how would you check the hydraulic fluid levels, tyre depths and chain. Then it was off for a ride around Erith while the examiner followed closely watching for any faults. It wasn’t the nicest weather and it was quite a busy morning so tensions were high! When we turned into the test centre I was happy I hadn’t had my test stopped. Sometimes students fail before they even leave the test centre due to leaving indicators on or forgetting a lifesaver look. A lot of people fail one or both of the tests before passing which is bad luck but good that the test is so tough. Off the bike and a couple more post test pillion rider requirement questions then back inside for the result. 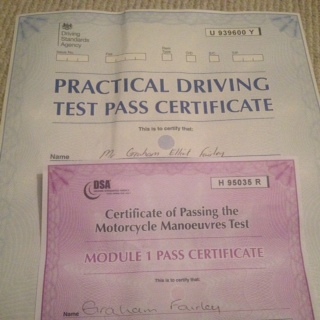 A few minutes on my own then I got handed the certificate…. Previous post ← My new friend for the next four or so months …..